Seen increased chattering amongst the airwaves about logo designs as we know it becoming extinct. That, if you are a logo designer who does not embrace the dynamic and animated brand identity, you will whither and die. That your very existence is threatened, neigh, is assured. Just for clarification. I’m specifically talking about the major brands, the brands that advertise on TV, the global and the national. Companies like Nokia & Swisscom. In the context of this brief post, animated logos are different to dynamic brand identities, and anyone with a passing knowledge of computer animation can animate a logo GIF for a website. The distinction is important as I think this chitter chatter has been way too generic and non-specific. Scaring the bejesus out of solo logo designers into thinking their lively hood is now extinct. Dynamic brand identities are not the same as animated logos. Dynamic, and the new buzz phrase, ‘moving brands’, are here, and here to stay. They have been around for some time and there is a definite shift towards this creation of ‘dynamic brand identities’. There is a company in the UK called ‘Moving Brands‘ a great name, and no surprise they come up #1 in Google for search terms ‘moving brands’. They have been responsible for some well known dynamic identities, notably Swisscom. If you want to get a real feel for the creative process behind Swisscom, the following video should adequately put into context the level of work needed to pull a dynamic brand identity off. But come on. Static logo designs are dead? Are you serious? Are you one of the ‘harvesters of doom’ bringing us the ‘end of the logo design’ bull? It’s just a bunch of strategic scaremongering, trying to create some kind of annoying ripple in the universe. Some of these preachers of the ‘static logo designers are a dying bread‘ are the very people responsible for creating these dynamic identities. Convenient coincidence? Dynamic identities require significantly more resources that your usual ‘flying solo’ logo designer will have at their disposal, hence the fear that logo designers are en route to extinction. They also require a rather hefty budget, and a significant brand presence to even consider it a worthwhile investment. They require intense planning, coordination, staff who have experience of animation and 3D rendering, as well as production artists, video editors and the such like. This particular sort of exciting dynamic brand identity come neither cheap nor quick, far out of reach of the clients that most logo designers deal with on a daily basis. There are exceptions of course, but it’s safe to say, they are not at risk of putting logo designers out of business. This then means that your day-to-day client, requiring a logo for their new business or company is not even close to needing the behemoth that is a dynamic brand identity. Not every company or business will even ever need a dynamic identity. They will still need their regular static logo design placed proudly on their vans, their business cards and letterhead. Can you imagine your local shop store, your NHS consultant, the new internet start-up, the interior designer deciding to hire an agency to create a dynamic brand identity? Not yet for sure. For the foreseeable future, and I’m talking many years here, there will always be a need for static logo designs. As a logo designer, it is important to start accepting that these dynamic identities are here to stay. It then makes sense that you at least spend time becoming familiar with this logo and identity design evolution. If you want to truly future proof your art, then start to study how the big boys do it, prepare yourself mentally. There may be a time when a client approaches you, where there may be an opportunity for you to create a logo that at least ‘has potential’ to be dynamic. Don’t do this at the expense of their brief, but if there is some overlap, take a look at the option. Don’t use your client as a live experiment, but be open minded. Just this week, I saw an opportunity to look at creating a logo design that ‘has’ potential to be more than just a static design. I didn’t set out with this in mind, but through the sketching and idea formulation, I saw a possibility to look at making a static logo that ‘could’ be injected with life. The logo works as it is, but there is scope to make it more than just a regular static design. This is a logo design in process, it’s a early concept and not the finished idea, but just shows the concept of being ‘dynamic identity’ aware. More on this logo idea over at Dribbble. 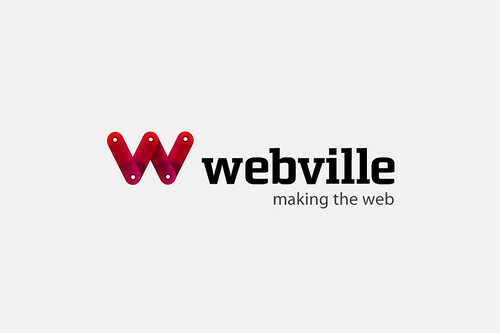 The whole concept of the logo idea is based around ‘making the web’, a team of web developers who design and code applications, stuff that works. It’s a simple concept, the ‘W’ is formed from individual modules or pieces, each with a pivet point, that connect to the next piece and ‘make’ the logomark. These pieces can be fixed or moved. Thus, each piece could be swung, rotated individually or as a whole, expanded or condensed like an accordion. It could slither along the ground like a snake, it could slip down the stairs like a mechanical ‘slinky‘. The only limit is your imagination and technical knowledge. Of course, this level of dynamics falls well and truly short of Swisscom, it doesn’t occupy a three dimensional space like the Swisscom identity, but with with careful lighting and editing, the ‘W’ could be brought to life, in a way more richer than a standard animated GIF. On a personal note, it brings me a tiny step closer to the exciting world of dynamic identities. When the technology, the software and the web changes to a point where it becomes easy and cheap to create exciting and practical dynamic identities, then I’m sure we will all be wanting one. But that time is way off. There is no real competition as yet, it’s not one or the other. There is no duel at dawn between Dynamic Identity & Static Identity. Both disciplines can and will co-exist for many years yet. Dynamic identities are not here to wipe us freelance logo designers off the map, but they are something to factor in as an evolutionary alternative to regular logo designs. In the meantime, if someone tells me face to face, that static logo designs are dead, I’ll likely just lamp them.